While we were out this morning something took a sparrow from our garden. I know this because we arrived back to find a large patch of tiny, downy feathers on the grass; between the blades, when I looked more closely, were a couple of dozen primaries 2–3" long, grey, but showing tawny on the leading edge. We have a good population of sparrows – something I'm pleased about, given their decline – and had just this morning filled up the bird feeder, to which they flock. Looking even closer, I found more gruesome evidence: the unfortunate bird's upper and lower beak (pictured), slightly bloody where they had been detached from the skull. This suggests it was eaten on the lawn, rather than carried away. As for what killed it, there are three potential candidates: a cat, a fox or a sparrowhawk. We get all three in the garden. 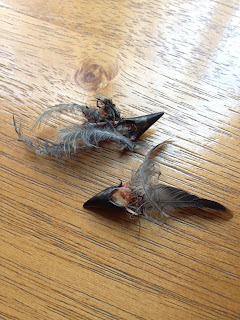 I'm not convinced that a fox would be fast enough, which leaves a cat or a sparrowhawk – and my money's on the latter. I think a cat would have carried it off to eat, and moreover I don't think so many feathers would have been left. Sparrowhawks pluck their prey as they eat. It's sad to lose one of 'our' spadgers – but I'd far rather it went to support a sparrowhawk and possibly its family than to a well-fed domestic cat. In fact, it's heart-lifting to live in a city that can support birds of prey, and to know that our garden is part of both birds' habitat makes me very proud.